Summer hot cooking tips feature outdoor BBQ for your desserts using watermelon. 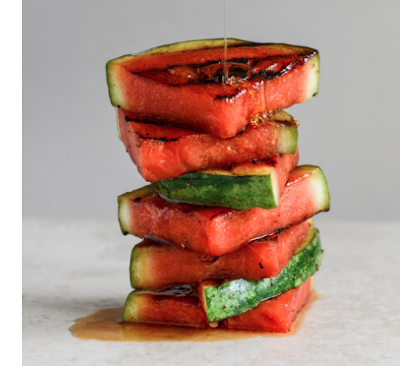 Honey grilled watermelon salad is sweet and simple at the summer’s peak. How to pick a good watermelon? Visiting your local Farmers Market is the best choice, but a local supermarket is another alternative. 2 large slices of the watermelon must be cut into four triangles. Preheat your grill to medium heat. Drizzle watermelon with olive oil and season all sides with salt and pepper. Add splash of honey over each watermelon and place them on the grill, grilling each side for about 2 minutes. Remove and add a little more honey if desired. Assemble salads by placing two watermelon triangles on each plate, then cover with a few grape tomatoes, thin slices of mozzarella and basil leaves. Add some salt and pepper on top, then drizzle with balsamic glaze (can be purchased at your local grocery store or made at home!